It does not happen to me often that I impulsively buy a book. This book was (automatically) recommended when I ordered another book and I saw Western esotericism and René Guénon, so I figured I might give it a go. Lachman wrote a large number of books about Western esotericism. Biographies of Crowley, Blavatsky, Steiner, Jung and Ouspensky, but also books Hermetism or the roaring 1960’ies. The name struck me as a popular author on the subject, even though I never read anything of Lachman. Reading the book, my initial thought proved to be correct. The book proves to be some sort of history of Western esotericism for the larger public. 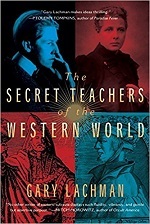 There is almost no information in the book that was new to me and the people that Lachman calls “secret teachers” are in fact the best-known people within the subject. The book starts in a somewhat original way. The author explains the “split brain theory” that says that our left brain is for our rational thinking and filter for the flow of information that our right brain processes. This right brain Lachman connects to esotericism. People who (naturally or by training) manage to reduce the filtering of the left brain are the seers, esotericists, mystics, etc. Then follow chapters about Hermes Trismegistus, ancient knowledge, Pythagoras, Plato, Aristotle, the Gnostics and then Lachman works towards more recent times with Alchemy, Kabbalah, Dante, Grail legends, then Renaissance, Rosicrucians, the upcoming of science, a little bit about Freemasonry, Romantics, Theosophy and its derivatives, Jung, Gurdjieff,The Beatles and the 1960’ies. Nowhere does Lachman really go into any depth. What is nice is that he sets timelines that run parallel next to eachother, so ‘suddenly’ an author like Arthur Conan Doyle is also an occultist and Crowley is set next to Jung. What I like about the book is that Lachman appears to be some sort of ‘Traditionalist light’ who like to speak about “philosophia perennis” and use terms of Henry Corbin, but apparently Guénon is not one of the “secret teachers” since he is only mentioned in passing, as is for example Eliade. Lachman is not allergic to modern Theosophists as is often the case with Traditionalists and he makes no sensation of Aleister Crowley for example. That makes the book a fairly neutral history. I already expected as much, but the book is ‘light literature’. You may run into a few names to have a look at better, but my guess is that the targeted audience is more that of beginners in Western esotericism.